Istanbul's popular Atatürk airport was plunged into chaos this week after a horrific attack by three suicide bombers killed at least 43 people and injured another 239. Turkish government officials say they have strong evidence that the bombings were carried out by the self-proclaimed Islamic State, or ISIS. The alleged ISIS attack has reignited concern about Turkey's "double game" on ISIS in Syria. Turkish President Recep Tayyip Erdoğan has long been accused of indirectly and even directly helping ISIS and other extremist groups in Syria, in their fights against Kurdish rebels and Syrian dictator Bashar al-Assad. For years, Turkey — a U.S. ally and NATO member — let ISIS and other violent Salafi (Sunni extremist) groups cross its open border with Syria, which some dubbed the "jihadi highway." The ex-ISIS militant said he "connected ISIS field captains and commanders from Syria with people in Turkey on innumerable occasions," and added that ISIS commanders "mostly spoke in Turkish because the people they talked to were Turkish officials." “ISIS and Turkey cooperate together on the ground on the basis that they have a common enemy to destroy, the Kurds,” he explained. Today, Turkey is technically fighting ISIS, having joined in the U.S. coalition against the fascist group. But this comes after years of alleged support for the Islamic State. David L. Phillips, director of the Program on Peace-Building and Rights at Columbia University’s Institute for the Study of Human Rights, has done extensive research on Turkey's alleged collaboration with ISIS. Salon spoke with Prof. Phillips. "Turkey was the midwife that created ISIS. Now ISIS has turned on its benefactor," Phillips said. Past Turkish support for ISIS was not just tacit, he argued. "Erdoğan and ISIS are both fighting the YPG and they cooperate." The YPG is a secular leftist Kurdish rebel group that has been both fighting ISIS and waging a revolution in northern Syria. The YPG is aligned with the PKK, a revolutionary socialist Kurdish group that has for decades fought for independence from Turkey. The YPG itself has also accused Turkey of collaborating with ISIS. In 2014, a spokesperson for the Kurdish rebel group said, “There is more than enough evidence with us now proving that the Turkish army gives ISIS terrorists weapons, ammunitions and allows them to cross the Turkish official border crossings in order for ISIS terrorists to initiate inhumane attacks against the Kurdish people in Rojava." Rojava is the northern Kurdish-majority area of Syria. Although they have collaborated in their fight against the Kurds, Phillips argued that the Islamic State has since come to resent Turkey for allowing the U.S. to use its Incirlik air force base for anti-ISIS operations. Phillips, who has also served as a former adviser to the United Nations Secretariat and an adviser to the U.S. State Department, has published a research paper detailing the many links between Turkey and ISIS. Turkey may have given weapons and military equipment to ISIS and provided transport, intelligence, medical care and training to its fighters, according to media reports and documents cited by Phillips. Turkey has also been accused of supporting ISIS financially through the purchase of oil, assisting it in recruitment and helping it fight the anti-ISIS Kurdish resistance in Rojava. Phillips said the airport bombings on Tuesday, June 28 look like an ISIS attack. He clarified that Kurdish rebel groups like the PKK and YPG do not usually target civilians; instead, they target Turkish soldiers and police, with whom Kurdish rebels have been at war. Extremist groups like ISIS, on the other hand, frequently target civilians, not just government military or security forces. It certainly looks like an ISIS attack. And there is no reason to think Turkish officials are being misleading by blaming the Islamic State. If the Turkish government wanted to exploit the attack for political gain, it would likely blame it on Kurdish rebel groups, against whom Erdoğan has been waging a brutal military crackdown. In fact, Turkey has in the past blamed attacks on Kurdish rebels that were later discovered to have been carried out by non-Kurdish groups. This is not the first time Turkey has been attacked by alleged ISIS members. In October 2015, at least 128 people were killed and hundreds were injured after two suspected ISIS suicide bombers attacked a rally of leftist, pro-Kurdish political parties. Erdoğan's ruling right-wing nationalist Justice and Development Party, AKP, condemned the massacre, but was accused of not doing enough to protect the left-wing, pro-Kurdish groups. Moreover, there were even reports that Turkish police had been ordered to block ambulances from treating the activists who were bombed. "A double game in Syria"
Robert Naiman, policy director at Just Foreign Policy and the author of the chapter on Syria in the book "The WikiLeaks Files," also told Salon he has a similar analysis of the situation in Turkey. "Turkey has played a double game in Syria with respect to ISIS, as the Turkish government basically admitted when it tried to suppress the reporting of Turkish journalists about it," he said, referencing the recent imprisonment of two prominent Turkish reporters who exposed how the Erdoğan government has directly armed Islamist rebels in Syria — in an incident one columnist described as "weapons to Syria, journalists to jail." "Turkey is certainly not the only country that has played a double game with respect to" extremist Islamist groups, Naiman noted. "So have the Gulf Sunni monarchies." "And so has the U.S., in the sense that the CIA is arming groups, as The New York Times has reported, that the president claims with little dispute that he could target under the 2001 AUMF as 'associated forces to al-Qaeda,'" he explained, using an acronym for the Authorization for Use of Military Force. "But Turkey is paying a higher price for the double game because it is closer to Syria," Naiman added. Pentagon officials have been reluctant to arm Syrian Islamist rebel groups who they say are linked to extremist groups like al-Qaeda affiliate al-Nusra. The CIA, which supports these groups, has butted heads with the Department of Defense in disagreement. Turkey and Saudi Arabia, both of whom are close Western allies, are also supporters of the Salafi militant groups Jaysh al-Islam and Ahrar al-Sham. The founder of Jaysh al-Islam, Zahran Alloush, called for religious minority groups to be cleansed from Syria's capital, Damascus, and Human Rights Watch says the extremist group likely put Alawite Muslims in cages to be used as human shields. Ahrar al-Sham has fought alongside al-Nusra, Syria's al-Qaeda. Despite their extremism, however, both Jaysh al-Islam and Ahrar al-Sham are members of the High Negotiation Committee, the Saudi-led alliance of some 34 rebel groups that are in peace talks to end the war in Syria. For several months, Mohammed Alloush, a cousin and brother-in-law of Zahran Alloush, was the opposition's chief negotiator in the peace talks, although he later stepped down in frustration at the lack of progress. In 2014, former U.S. ambassador to Turkey Francis Ricciardone also accused Turkey of directly supporting al-Nusra. “The Turks frankly worked with groups for a period, including al-Nusra, whom we finally designated as we’re not willing to work with,” Ricciardone said. The U.S. government considers al-Nusra a terrorist organization. Yet Saudi Arabia and Qatar have been accused of supporting the extremist group. The U.S. is also playing its own double game in Syria and Turkey. In Syria, it is supporting Kurdish rebel groups that are fighting ISIS — and, to further complicate it, the Pentagon is arming Syrian Kurds, which are secular leftist forces fighting Islamist extremists, while the CIA is arming Syrian Islamist rebels, which are actively fighting both the Kurds and Assad. Meanwhile, in Turkey, the U.S. supports the government and opposes Kurdish rebels, even though Turkish Kurdish rebels are, for the most part, allied with the Syrian Kurdish rebels that the U.S. supports. 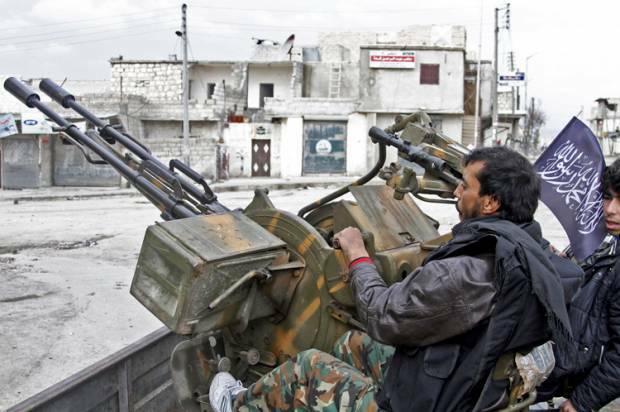 Moreover, a recent report by The New York Times detailed how millions of dollars of weapons sent by the CIA and Saudi Arabia to Syrian rebels were "systematically" stolen and sold to arms traffickers on the black market. This is the kind of twisted web that the war in Syria has morphed into in the past five years. Dozens of countries are fighting for their piece of the pie, and the harsh repression of the Assad regime and the intense fighting from foreign-backed rebels has turned Syria into an imperial battleground that has destroyed the once middle-income country and plunged it into a level of extreme destruction, chaos and desperation that will take decades to fully recover from. "Turkey is isolated and enfeebled," David L. Phillips told Salon. "It's at war with its neighbors and, by virtue of its unjustified attacks against the Kurds, Turkey is at war with itself." He pointed out that Kurdish rebels are on the verge of connecting the Syrian cities Azzaz and Jarablus, which would allow them to form a security buffer along the Turkey-Syria border. "Turkey wants to establish the security buffer but its arch-enemy, the YPG, controls this route," Phillips explained. Erdoğan has become increasingly authoritarian and repressive in recent years. His regime has seized control of opposition newspapers, brutally clamped down on reporters and press-freedom advocates and claimed journalists who undermine his government are terrorists. Prosecutors have opened more than 1,800 cases against people on charges of insulting Erdoğan since he took office in 2014. Young students have been imprisoned for accusing him of corruption, and people have been sued for comparing him to "Lord of the Rings" character Gollum on social media. Moreover, for months, Turkey has literally been at war with itself. The Erdoğan regime has waged a destructive military campaign against Kurdish rebels within Turkey proper, displacing hundreds of thousands and killing hundreds of civilians in the process. The U.N. High Commissioner for Human Rights has said Turkey is killing, torturing and displacing large numbers of Kurdish civilians in "highly disproportionate" attacks. According to the U.N., the Turkish military has "deliberately" killed innocent Kurdish civilians, shooting them with snipers or with gunfire from tanks. In one instance cited by the U.N., more than 100 people in the Kurdish-majority city of Cizre were burned alive. 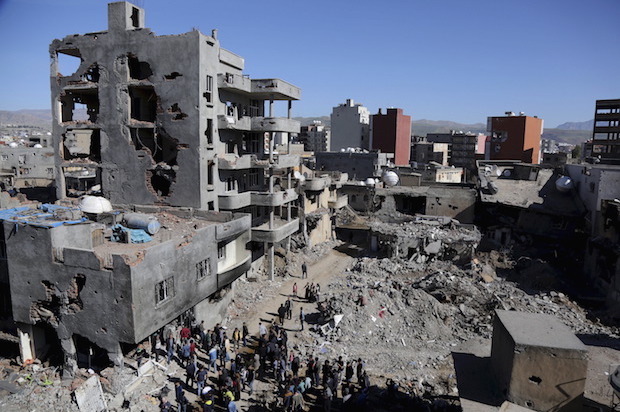 Large parts of Kurdish-majority areas in Turkey resemble the blood-stained rubble in Syria, although the crimes of Erdoğan, a close Western ally, have received little media coverage. The U.N. High Commissioner for Human Rights condemned the "black-out" of information, which it said "fuels suspicions about what has been going on." German human rights activists and lawmakers filed a civil suit against Erdoğan this week, accusing the Turkish regime of committing war crimes against Kurds. With the region on fire and extremism on the rise, some say the Turkish government's policies are coming back to haunt it. Unfortunately, it is the Turkish people who are paying the price.